A really CAS card, the sentiment is from Heartfelt Creations Believe set, stamped in Chocolate on White card stock. The Chipboard frame is sponge in Velvet Distress Ink, the edges in Chocolate. I added some Spun Sugar Distress ink to the Prima and added the Stick Pink and Chocolate Pleated Ribbon (thanks Sue!). 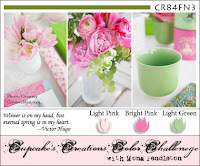 The beautiful BG paper is from Prima. To finish the card, I lightly misted with Rangers Perfect Pearls Mist. Beautiful, I love that sentiment and the little flower is so precious. Glad you are feeling better! 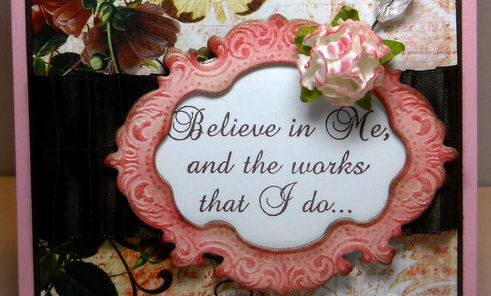 Love the flowery background paired with the beautiful frame flower and sentiment! It should be CAE = clean and elegant! Glad you're feeling better! Lovely card! 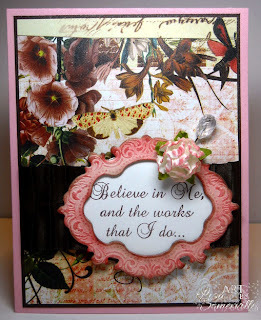 The frame around the sentiment is stunning and of course the flower is a beautiful finishing touch! Glad you are on the mend! Two weeks is too long to not feel well! This is lovely, sure showcases that sentiments so nicely. I can see you are feeling better! Beautiful card GF! I hope you are feeling much better! 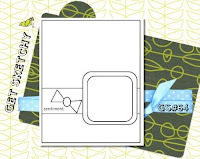 I love the papers you used on this card, beautiful! So glad you are feeling better, Lisa. Take it slowly...I had it for over 5 weeks, because every time I felt a bit better I over did it! This is really just beautiful! I love the colors in the frame...and the words...beautiful! Fabulously beautiful. I love your color choices. So elegant. Beautiful card - see we both reached for Webster's with this one!